We're all pretty well travelled these days, which means it's an absolute necessity that we know how to pack a bag properly. We've got all the insider tips below on how to pack a bag properly for both business and pleasure. Back in the day, it's safe to say that most men would have left their bag packing to the ladies in their life; passing the burden on to wife/mum/girlfriend each time a trip away comes up, whether they're lucky enough to be invited or not. Not one to promote stereotypes, we wouldn't dare suggest anything of the sort nowadays, however; we will say that you're probably leaving it until the last minute and not really doing it right... so that's all of us then? Knowing what to take, how much, and how on earth to arrange it in the bag feels like a riddle of the highest order most of the time, so we end up throwing in a ton of stuff we don't need. Or, worse again, do the blokey thing of thinking we have enough with one pair of trousers, two shirts and a shoe. Na-ah! In this guide we advise you on all the do's and don'ts when it comes to packing, and give you all the essential tips on what to take away with you, as well as how to avoid arriving at your destination to a bag full of crumpled clothes. This might actually be the hardest bit of the whole sorry affair; even harder than the packing itself - something I never thought I would say. When faced with an empty bag and a very full wardrobe, things start to get a little daunting. The key is to pack light, but not to rule out things that are going to be very important at the other end. Don't pack two full outfits for each day you're going to be there as that's clearly excessive, but definitely don't pack one outfit for the five days of your stay, as you'll probably smell. You get the idea. A good rule to stick with is, a pair of trousers for every 2-3 days of your trip, a top and underwear for each day, then add one extra of each for a 'just in case' moment. Once all the basics are packed, pick out any essential extras that your trip may require. Do you need swimwear? A formal suit? Some cold weather attire? Stick to the essentials and you'll be grand. A lot of guys prefer to sleep in their underwear rather than PJs, however when going away it is important to take at least one pair of pyjama bottoms just in case you have a visitor to your room or need to leave you room suddenly in the night. Those fire alarms have a tendency to catch us off guard! Lastly, make sure to take an empty bin liner with you; this is something I swear by. This way you can keep all your dirty clothes separate from the clean stuff making it so much easier when you land back home again. Make a list...and check it twice, even Santa knows where it's at! Rather than waiting 'til the night before you go away, going in to panic mode, and then chucking whatever's lying around in to a bag - be prepared. There is just so much that can be said for preparation guys! If you sit down and create a general list (god I love a good list) which can be used as your go-to whenever packing for anything, this will save you so much time in the long run; and any time spent avoiding packing is good with us. 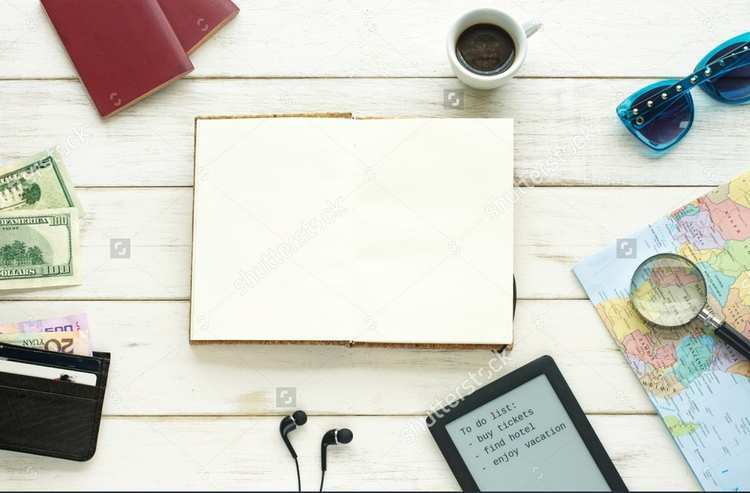 A list is all kinds of wonderful, as it not only helps make sure you don't leave anything behind, but it also prevents you from over packing and having a load of stuff you don't need; cluttering up your hotel room and costing you a fortune in excess baggage fees. Keep your list as a go-to each trip, and just add on extras each time depending on where you're going and whether you need anything more specific. We've all been there; arrived at our destination in shorts, flip flops and a vest, only to be greeted with torrential rain and clouds that resemble the end of the world. Not cool. It's that preparation thing again. Check check check before you go; check every day of the preceding week if you have to, as technology is so advanced these days that the forecast can change literally every minute. Do a final check the night before and make sure that you pack your bag accordingly. A lot of us decide to forgo this stage and just pack for all weather-related eventualities, however this completely defeats the object of this whole article, so please don't do that. That said, if going to a hot country we would always suggest taking some kind of lightweight jacket along with you, just in case the evenings are a bit chillier; there's nothing worse than being caught out in the cold. 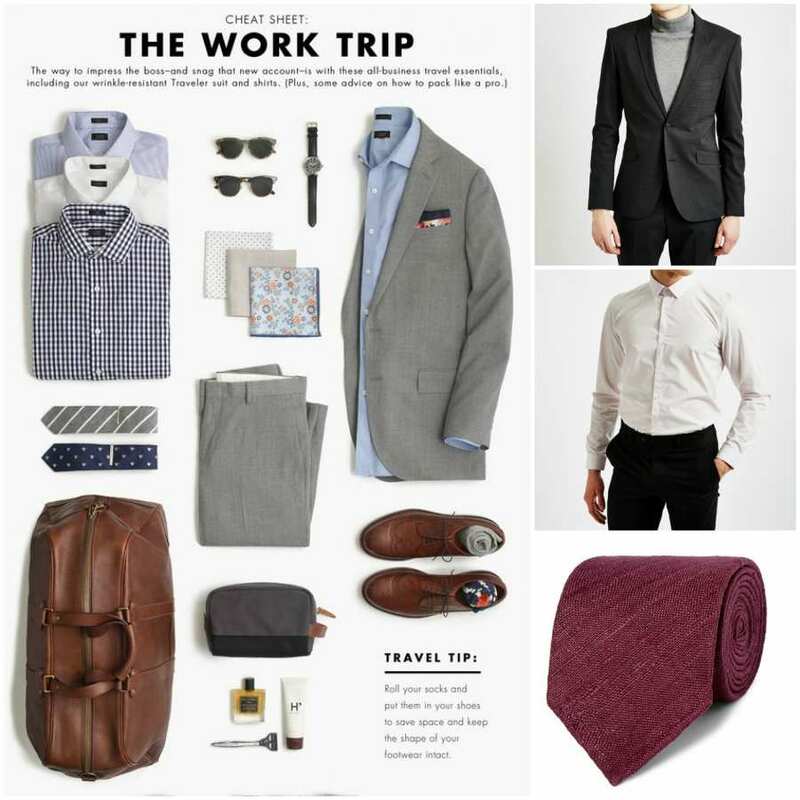 Below we'll tell you about essential skills like how to fold clothes for travel, how to pack a suit in a suitcase, how to pack ties, and even how to pack shoes. By placing one garment between the folds of one another, you can avoid creases from forming and also save on space. Below we have outlined how best to fold a shirt, a pair of trousers, a tie, and a few t-shirts. Shirt: Button the top, middle, and bottom buttons of the shirt. Lay the shirt face down on a flat surface, and place your finger about an inch under the collar. Fold in each sleeve from this point, forming a straight edge and line the sleeves up with this. Lay your tie down the length of your shirt, without folding it at all, and place a folded t-shirt at the point that you intend to fold the shirt. Fold over your shirt, and fold in any part of the tie that is left hanging out. Trousers: Lay them flat and place another t-shirt at the point where you intend to fold- then do so. Here you could place another folded t-shirt on top of your trousers. Fold the bottom part of your pants over the t-shirt. Flip your trousers, waistband up, and place another t-shirt over the part where you want to fold the waistband over the remainder of the pants. You should end up with three folds in total, with t-shirts in between each one. This traditional method is one you've probably heard of and tried out before; but did you do it right? Roll up all garments that don't wrinkle as easily, such as underwear, t-shirts, jeans, and cotton trousers. Fold items like dress shirts, dress pants, and dress coats. Place the rolled up items all along the bottom of the bag and place the folded pieces on top. Place your shoes and socks along the sides of the bag or in any spare crevices e.g. socks and ties inside shoes. 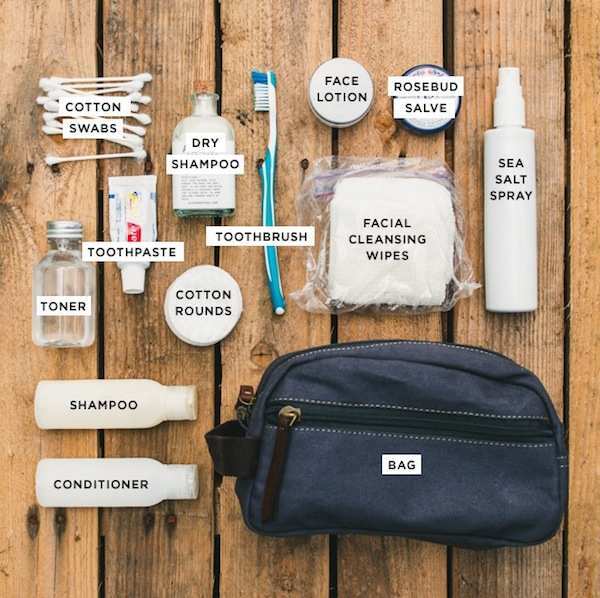 When it comes to toiletries, there's usually some separate compartments inside your bag or suitcase; use these for packing some of your toiletries. Larger items such as sun cream, face wash and moisturiser can all go in here, but again only take the essentials and reduce the sizes of anything you can. Travel size toiletries are great, in particular for shorter trips where you won't need as much of the product. In this instance it is advisable to place these in your hand luggage to give you more room in your hold bag, and it will also mean that if your bag gets lost you still have all your (often expensive) toiletries with you. For anything you can't buy in travel size, there are empty travel sized containers available now, which you can fill yourself with your favourite products. Make sure you place all liquid based items for hand luggage in a clear zip lock bag to avoid holding everyone up at security... totally awkward. 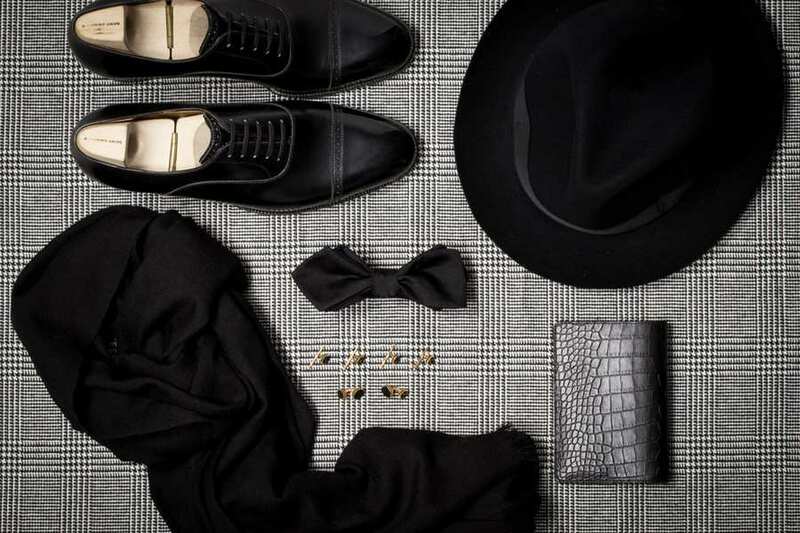 Packing for a business trip is important as you, no doubt, want to make a good impression; and chances are you will be meeting some new colleagues or important clients. We've already been through how to pack a pair of trousers, but do you know how to pack a suit jacket? Spread the jacket out on a flat surface, face down with the collar up and the sleeves out straight, smooth, and free from wrinkles. Turn the sleeves up so that the bottom of them is about level with the armholes. Fold the front side parts of jacket so that the edges meet at the back centre seam. If packing in a suitcase: double up over the sleeves to the top of the collar. Pick up at either side and lay flat in suitcase. If packing the suit in a duffle bag or holdall: smooth out wrinkles, fold left side in to right side, top over bottom, and lay flat in bag. Packing and folding dress shirts for travel does sound kinda daunting, doesn't it? Have you ever wondered how to fold a dress shirt for travel? Don't panic! It's just the same as folding a standard shirt as shown above; just be careful to keep the front pleats flat, as too long squashed in the wrong position is going to make it difficult to get them back to normal. Dress pants and tuxedo jackets or more casual blazers also go by the same rules as packing dress shirts, so once you know how to fold a couple of items properly, you know how to do them all! Start by ensuring the trousers are ironed, if they're anyway wrinkled - it'll only get worse with travel. Lay the dress pants out flat and rub out any creases or wrinkles. Fold the trousers over each other right down the middle so one leg is overlapping the other. Fold them in half vertically by bringing the cuffs up to the waistline. Fold in half once more, and you're ready to go! When it comes to packing shoes there's little advice to be given except to pack them lying down on their side around the edges of your case. Where possible, it's a good idea to pack your socks, underwear or other small trinkets inside the shoes to make the most of space and avoid you loosing any small bits in your suitcase. Before you even consider packing, you need to invest in some major luggage to earn you style points and protect your stuff. 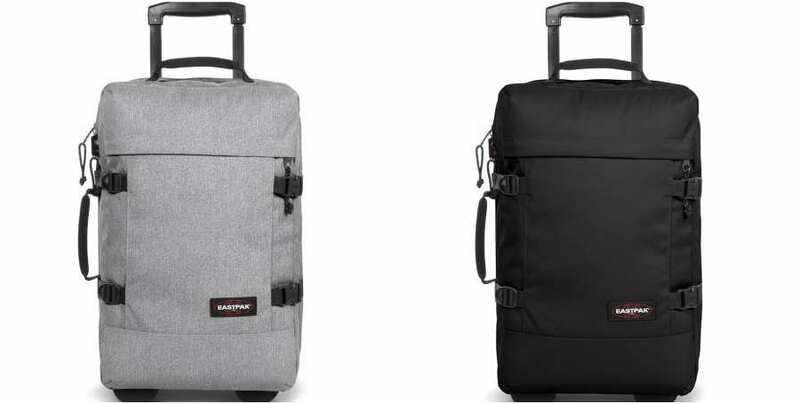 By getting yourself a couple of great bags or cases, you are ensuring that your travels are made easy and that all your stuff is protected for a long time coming - if you invest properly, they will stand the test of time. Ideal for a quick weekend away, or a snappy city break. 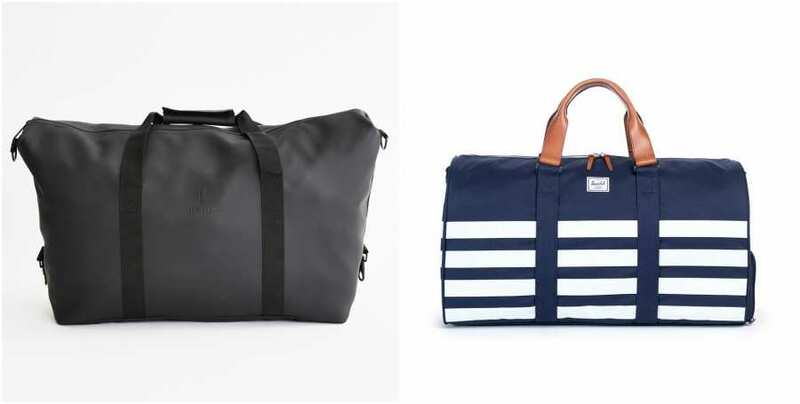 If a holdall is right up your street then the options below are ideal; either leather or synthetic, depending on your personal style, they're both ideal for when you don't want to be weighed down by serious luggage. A duffle bag is another great option for weekends away and short to mid length business trips. They're incredibly versatile and come in a large variety of styles, so there's something for everyone. With a duffle, go for a roll packing method as the space is more limited than other options. Smaller items such as socks and ties should be shoved inside shoes to save even more space. While packing a suit inside a duffle bag isn't ideal, sometimes these things have to be done. Start by holding your suit jacket by the middle of the collar, then place one shoulder inside the other so that your suit is inside out, then fold in half and pack! If something a little more structured is what you're after, opt for a rolling suitcase which teams fashion and functionality. With a suitcase you have a bit more space. Try placing shoes in first around the edges and fit in smaller items around them. If you're really wondering how to pack a suitcase properly, check out the video in our intro for a step by step guide. No matter where you're going on your trip, a great bag and our top tips will get you and your stuff there in one piece and wrinkle-free (well, we can't promise you won't be wrinkle free - that's down to you). Always plan ahead and make a list to avoid over and under packing, and once all is said and done, enjoy yourself! That's what travelling is all about after all. Now where are you off to? Berlin? Chicago? Ibiza? Check out more of our city guides to see if we've got you covered.